The 2017 Kia Sedona has arrived in Lehighton, PA. This minivan has been completely redesigned with comfort and luxury in mind. The 2017 Kia Sedona comes in five different trim levels: L, LX, EX, SX and SXL, and starts at an MSRP of $26,800. The 2017 Kia Sedona also comes in a variety of exterior colors. While the standard L model is only available in Clear White, Bright Silver and Aurora Black, the LX and EX models offer the most color options. These colors include the colors previously listed, as well as: Beechwood Pearl, Platinum Graphite, Venetian Red, Midnight Sapphire and Titanium Bronze. The SX and SXL models include the same color options as the LX and EX, except for Beechwood Pearl. 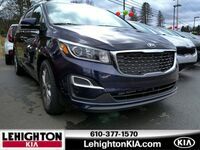 Let’s look at some of the features available in the 2017 Kia Sedona in Lehighton, PA.
Kia went above and beyond when making the 2017 Sedona comfortable. Along with the spacious cockpit, the available First-Class Lounge Seating in the SLX model allows for the second row of seats to recline with retractable footrests, adjustable armrests and winged headrests. Heated front seats are also available in all but the L trim level, and ventilated seats which keep you cool come standard in the SX and SXL models. Each trim level of the 2017 Kia Sedona is fitted with a 3.3-liter, Lambda-II Gasoline Direct Injection V6 engine. The engine is capable of reaching 276 horsepower and 248 lb-ft of torque. The 2017 Sedona also has a towing capacity of 3,500 lbs. The L, LX and EX models also get a fuel economy rating of 18 city/24 highway MPG. The SX trim level gets an MPG rating of 18 city/25 highway, and the SLX gets 17 city/22 highway. The 2017 Kia Sedona has many safety features that come standard in each model. These include but are not limited to: Cornering Brake Control (CBC), Hill-Start Assist Control (HAC) and the Traction Control System (TCS). CBC will help you stay on the right path during tight turns, HAC will help you keep your Sedona in place as you drive on an incline and TCS will provide your van with traction to avoid wheel spin. Loading cargo into your vehicle has never been easier. The Slide-N-Stow seating allows for the second row to fold upright while the third row stows underneath the floor. The 2017 Kia Sedona also has a Smart Power Liftgate which automatically opens when it senses your smart key. Every 2017 Kia Sedona model has a total of 142 cu ft of cargo volume, with 78.4 cu ft behind the second row of seats and 33.9 cu ft behind the third row. If you would like to learn more about the 2017 Kia Sedona in Lehighton, PA, visit us at Lehighton Kia. If you would like to schedule a test drive of the new model, you can fill out the form on this page. We would be more than happy to assist you in any way we can.